That second photo? It’s the first time I’ve seen such an ethereal airliner making its way through the skies (cockpit to the right, tail to the left). Perhaps it’s the plane that left the contrail! I saw that phantom airliner, too, but chose not to say anything; that way I could find out if other people also saw it, and you did. No surprise there, right? And yes, how appropriate to see a plane made of clouds that a plane made. 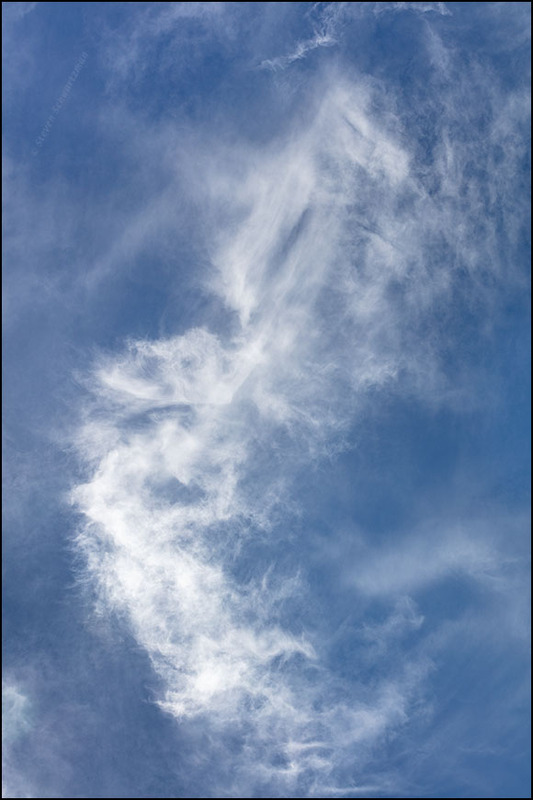 In the summer months, I often take a dip in the pool in the late afternoon (mostly to cool off after working in the heat most of the day) and I always find myself looking at cloud formations. It’s so relaxing to watch them move lazily in the sky. We also have several military air bases in the area (including Sheppard in Wichita Falls, TX) that do fly-overs all year long. It’s fun to try to find those tiny flyers among various clouds and formations. But my favorite time to watch clouds is when storms approach in the spring. I rarely get a great view of storms moving in from a distance since we’re located in the trees here, but they’re still just plain fascinating to me, wherever I am! Yes, cloud-watching is a great pastime. I’ll bet it’s universal. It lets the mind wander (though mine does just fine at wandering without any clouds). I remember watching clouds in a little town in Honduras in 1968 while listening to a Brahms symphony on the short-wave radio. My mind melded the clouds and the music and I’ve thought of Brahms having a cloud-like sound ever since. When it comes to watching clouds as a storm approaches, is there any clearer vantage point you could move to while still keeping safe? Yes, Steve there is! I jump in the Mule UTV and head to the west end of our orchard property where we have a clearer view of the SW and southern skies. That’s the direction most of our summer storms come from. I’ve had to drive top speed heading home a few times when I waited too long to make it to safety at home! The dogs and I have been out in some downpours and wild winds, and even hail! Sounds like you’ve pushed it a little too far and long at times, but you’ve obviously lived to tell the tale. If you have a weather-resistant camera, it would be good if you could get some pictures capturing the energy of an approaching storm (again, while still keeping safe). Good idea! Hadn’t thought about “weather-resistant” cameras. Any suggestions on a rugged model that’s moderately priced? Wow! Thanks, Steve. As much as I’m out there, I think it would behoove me to look into a good weather-resistant camera. Speaking of the fact that it behooves you, you could get some pictures of animals with hooves. Those are beautiful! I can see why you whipped out the camera and captured them. Thanks for sharing. You’re welcome. I took plenty more, some of which I like as much as these, but I feel it’s rarely good to show many images of one type at the same time. These are great, Steve. I’m partial to cloud photos, too. I have 4 prints of them in my kitchen. They are very recognizable subjects but also abstract at the same time. 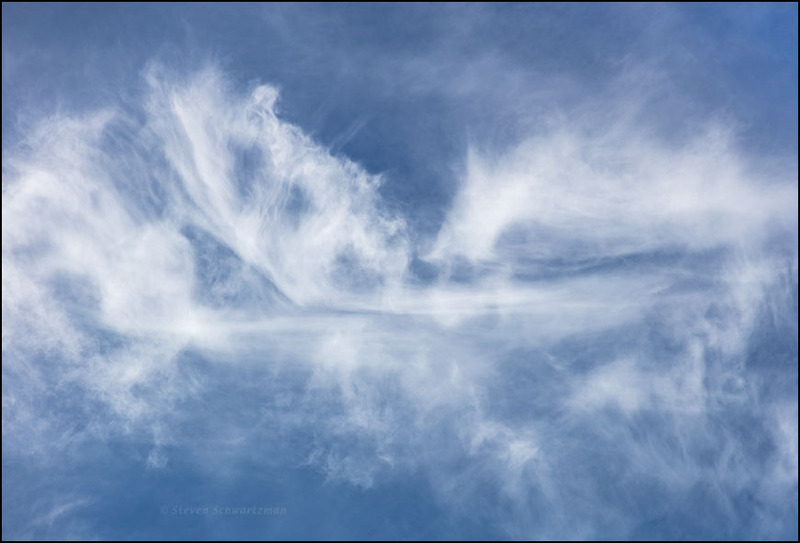 Wisps aplenty in your skies that day. Ordinarily I try to not have contrails in my pictures but in this case they are an asset. Wisps aplenty indeed. Like you, I normally avoid contrails, or at least those that still look linear. Once the winds break up those lines and make them wispy, I have fewer scruples. 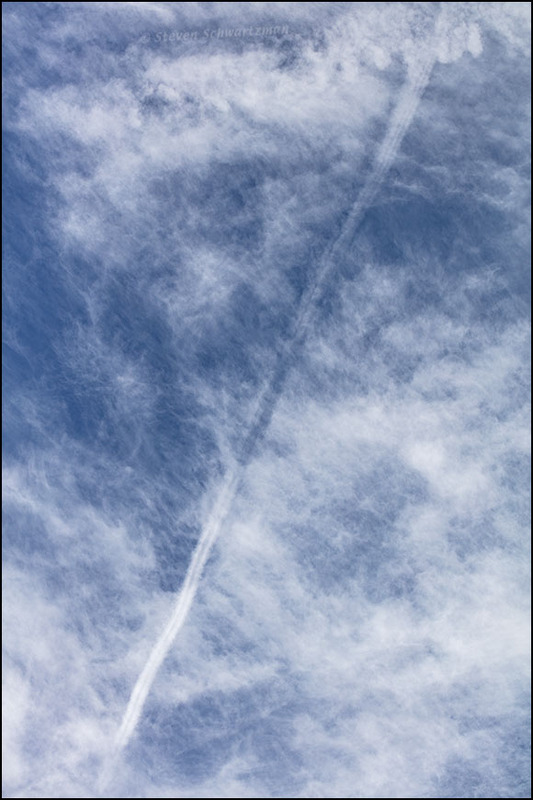 I once quipped that a contrail could’ve been made by a plane flying for American Airlines and was therefore native. 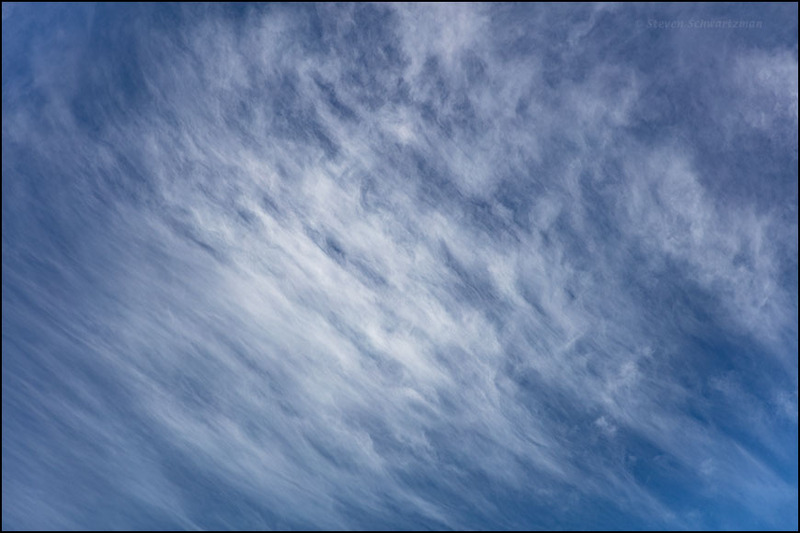 Clouds are wispy, whimsical, and very fleeting pieces of art. You wait a moment, and another brushstroke has been added or subtracted. You’ve written a good description of celestial art.